This is the story of me creating one of my original abstract art pieces. When painting or looking for inspiration to complete my pieces I quite often turn to music. And I know that I am by far not the only one who does so. I’m sure that many other creatives turn to music for inspiration, or at least as a way to get their creative juices flowing. Just about everything in life (from cleaning to long drives in the rain and everything in between) is better with music. Music, I believe, just has a way of speaking to the soul, of evoking emotions you didn’t even know you had buried deep inside. I believe it transcends differences and barriers and finds a way to connect us to even the most abstract, unlikely and unique aspects of life. I think that music, just like visual and other forms of art, is universal. Speaking of music, one of my favourite instruments is the violin. Both its sound and its romantic, curved shape have always captivated me. Drawing from that fascination I found the inspiration for this piece. As usual, staying loyal to my love for bright colours, and smooth brush strokes I opted to use reds, yellows, pinks and oranges and juxtapose them with greens and deep purples. I used the darker, more muted tones to accentuate and emphasize the vibrancy and energy of the crimson and golden tones. If you have been following me and my art for some time now, then you know that I love using nature/floral motifs almost as much as I enjoy using rich, bright colours. 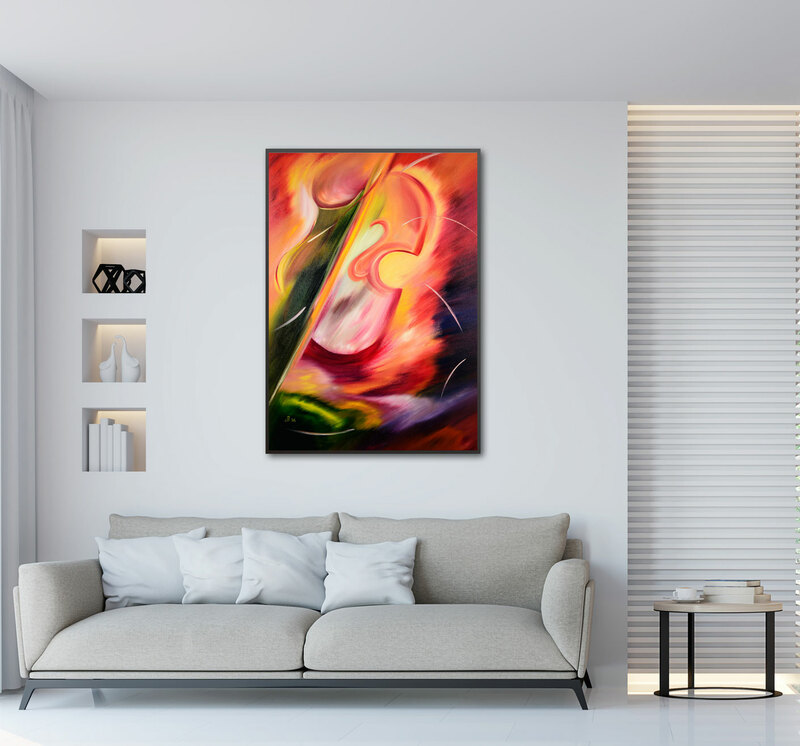 In this particular piece, I wanted to utilise both – the natural motifs that are present in many of my other paintings and the elegant shape of the violin. I wanted to use these in a way that was interesting yet remained true to my artistic style. 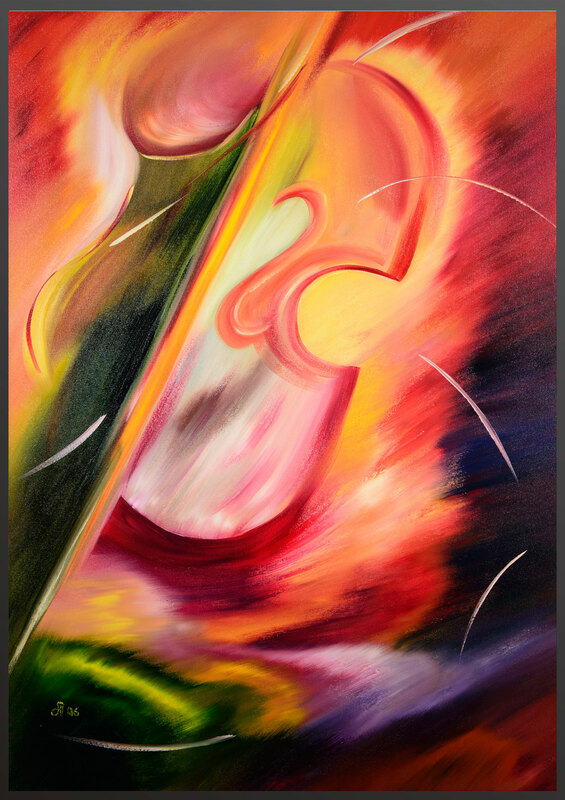 My goal with this piece was to try and translate into paint, colour and 2D shape the beauty, intensity, life, excitement and passion, essentially all the different emotions that the violin may evoke from the listener of a complex musical arrangement. The next time you get the chance to see an orchestra perform I encourage you to make sure you pay special attention to the violin players, their; concentration, energy, focus, emotion, the way they virtually become one with their instrument and move as one whole unit. I find it to be very enchanting. I hope that the energy and vividness of this piece have a similarly enchanting effect on you and whoever else happens to come across it whether in your home or office. May the rich colours and the flowing brushstrokes bring life and creativity into any space you choose to decorate with this piece. Make it a stand out piece of artwork or use it as a gift for anyone who appreciates art, music and colour. Whatever you choose to use this piece for I am sure that it will carry with it the passion, beauty and skillfulness of a well-trained violinist!